With its sleek profile, distinctive cast aluminum outer back and an innovative back suspension system, You is the chair designed with you in mind. Turning the activation dial causes the flexible internal frame to straighten or bow, providing the necessary support and lift to create the ideal convex curve that conforms to the user’s back. The single most important part of a healthy work environment is your ergonomic task chair. Fitting the “You” chair to your body is both easy and intuitive. At the core of the “You” chair is a deluxe synchro-tilt mechanism that smoothly reclines in perfect synch with your body movements. This visually appealing mechanism includes infinite tilt lock, seat pan adjustment, tension and height adjustment. Simply turning the activation dial a few clicks causes the mesh to bow and provides the precise tension you need. 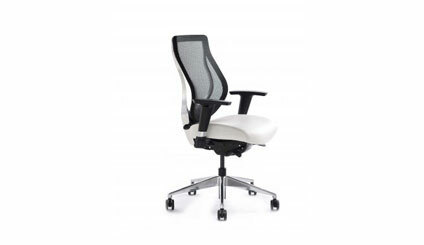 This is simply one of the best mesh back ergonomic task chairs on the market today. Because we spend so much time sitting at a desk, spinal compression has become one of the major causes of back discomfort today. “You promotes proper posture -encouraging you to sit naturally in the ideal position regardless of the task at hand. The “You” chair engages your core muscles, elongates the back, opens your chest and keeps your shoulders down and relaxed This means you sit tall and light on your sit bones. In both high and mid back, the “you ” chair is a very comfortable and ergonomic sit. Put it behind any desk or conference area to ensure great comfort and posture as well as esthetics. The You Midback mesh back office task chair is available in a variety of colors and the seat comes in many different fabrics. Call me for a price!